The exhalation rate provides a measure of the liberation of radon/thoron from inside a sample to outside the sample. Radon exhalation is a complex phenomenon depending on a number of parameters such as amount of 226 Ra and 232Th in soil, soil morphology, soil grain size, soil moisture, temperature, atmospheric pressure, and rainfall. Radium acts as a permanent source of radon and is found in small quantities in all solids, rocks, and materials although the amount varies from place to place. The long half-life of radon (3.824 days) makes it important to study in residential building and workplaces. Most radon in homes comes from radon in the soil that seeps into homes through cracks in the foundation or slab. Hence, radon exhalation rate from the soil or building material is an important parameter for estimating local environmental radon level. The radon and thoron exhalation from soil is the major source of indoor radon/thoron concentration which is responsible for contributing half of the natural radiation dose to humans. The inhalation of radon and its daughter products can cause a significant health hazard when present in enhanced levels in the enclosed indoor environments such as a human dwelling. Lung cancer is the principal health concern associated with radon exposure. According to the United Nations Scientific Committee on the Effects of Atomic Radiation, average annual effective dose to an individual from naturally occurring sources of ionizing radiation has been estimated at 2.4 mSv, out of which 52% is due to inhalation exposure and 92% of this fraction is contributed by the radioactive element radon and its progenies. The presence of radon itself is of no consequence to humans but that it is radioactive and emits the potentially harmful alpha-particles is the main cause of concern, and the danger mounts as most elements in its chain of decay products also emit alpha particles. The objective of the study is establishing a comprehensive baseline database of the radon/thoron exhalation rates in two districts of Punjab state and compared the obtained results with the reported values given by other researchers. 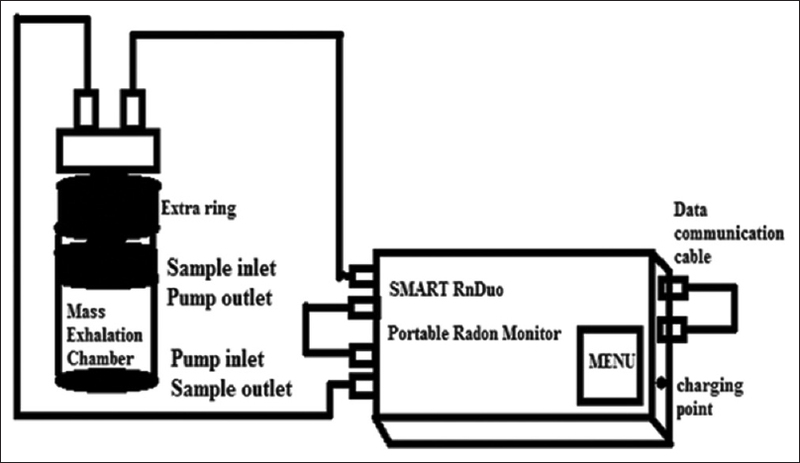 The measurement of radon/thoron exhalation rate has been done using SMART RnDuo portable radon monitor. Fitting the experimental data provided the information on radon exhalation rates. The geology section of the present study includes two neighboring districts, i.e., Amritsar and Tarn Taran of Punjab state [Figure 1]. Amritsar district is one of the 22 districts located in the Majha region of the state of Punjab in North India. Its western side adjoins Pakistan, partly separated by the river Ravi. The north-eastern side is bounded by the Gurdaspur district, and two districts i.e., Kapurthala and Tarn-Taran are situated along south-east side across the river Beas. The soil of Amritsar district is a light reddish-yellow loam. The physiographic of Amritsar district is the product of alleviation by the Beas and Ravi rivers. Amritsar district has two major landforms, namely alluvial plain and flood plain. Alluvial plain constitutes the major part of the district. This unit is formed by the alluvial deposits brought by Ravi and other rivers of Indus system. The alluvial plain along the Beas river is dissected by the back erosion, and there is a chain of gullies or ravines along the river Beas. This plain abruptly rises above the Beas river in the east and slopes very gently toward the Ravi. The flood plain of Ravi and Beas rivers is the other landform in the district. The entire area in the district is underlain by quaternary alluvium comprising fine to coarse sand, silt, and clay, with intercalations of pebbles and kankar. Tarn Taran district is one of the districts in the state of Punjab in the North-West Republic of India. The main cities are Tarn Taran Sahib and Patti. 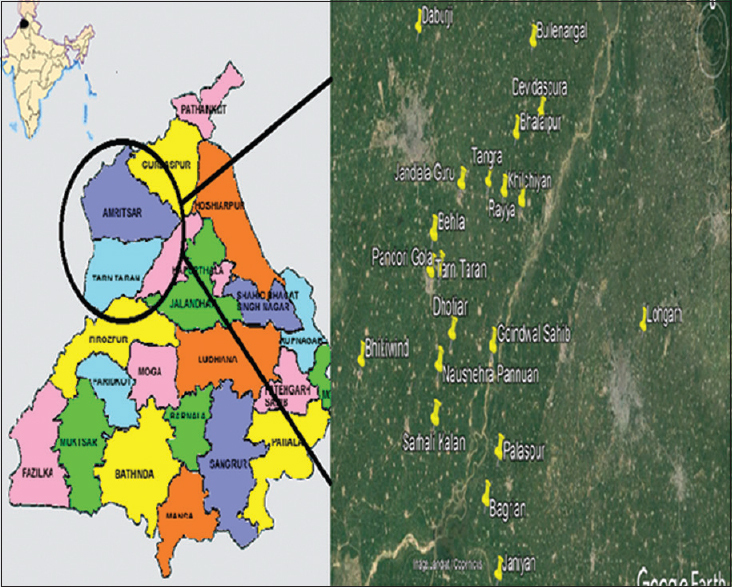 Tarn Taran district lies between 31° 05' 00” and 31° 30' 05” north latitude and 74° 30' 00” and 75° 15' 05” east longitudes. It has a geographical area of 2449 sq. km. It is bounded by Amritsar district in the north, Kapurthala district in the east, Pakistan in the west, and Firozpur district in the south. It is bounded by river Beas in the southeastern side. Physiographically, the district represents alluvial plain. The district falls in Ravi sub-basin, Beas sub-basin, and Satluj sub-basin of Indus Basin. The groundwater available in the greater part of the district is generally fresh but hard, except in the southern part of the district where it is of inferior quality, being saline to bitter. The groundwater in general is suitable for irrigation and domestic purposes. 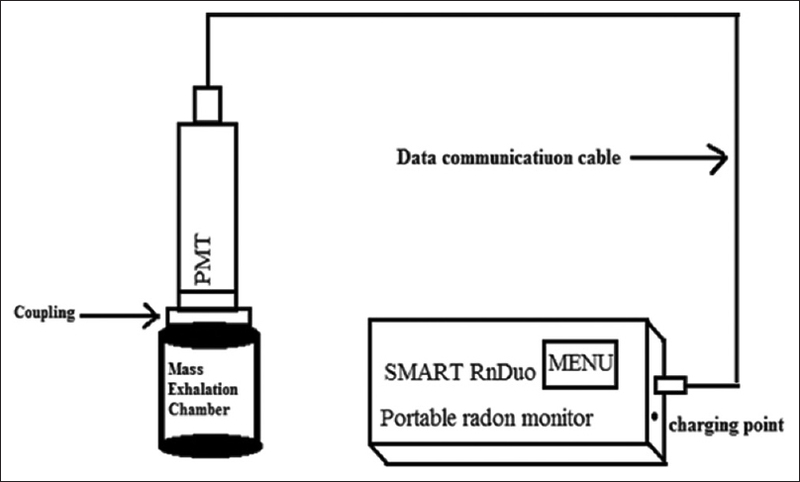 The radon mass exhalation rate of the selected locations has been measured using SMART RnDuo radon monitor, calibrated, and developed by BARC, Mumbai., The principle is based on detection of alpha-particles, emitted from the sampled radon/thoron, and its decay products formed inside the detector volume (153 cm 3), by scintillation with ZnS (Ag). The sampling should be done preferably by diffusion mode, and detector probe should be connected to the mass exhalation chamber directly [Figure 2]. Air is sampled into the scintillation cell through a “progeny filter” and “pinhole plate” eliminating radon progenies and thoron. The “diffusion-time delay” given by pinhole plate does not allow the short-lived thoron (220 Rn, half-life 55.6 s) to pass through them acting as “thoron discriminator.” The alpha-scintillations from radon and its decay products formed inside the cell are continuously counted for a user-programmable counting interval by the Photo-multiplier Tube (PMT) and the associated counting electronics. Where JRm (Bq kg −1 h −1) is the radon mass exhalation rate, C0 is the radon concentration (Bq m −3) present in the chamber volume (cm 3) at t = 0, M is the total mass of the dry soil sample (kg) inside the chamber, λe is the effective decay constant for radon, t is the measurement time (h), and V is the effective volume. The measurement cycle was of 24 h. At the end of every 1 h, the detector gave the radon concentration. After plotting the obtained values of radon concentration against time period, the value of radon mass exhalation was calculated. Where JTs is the thoron surface exhalation rate of soil sample (Bqm −2 h −1), A is the surface area of the chamber (m 2), VT is the effective volume (m 3) (i.e., residual volume of chamber + internal volume of detector + volume of cylindrical pipes + residual volume of lid over the chamber), CT is the thoron build up concentration inside the chamber (Bq m −3), and λ (0.0126s −1 assuming half-life is 55s) is the decay constant of thoron. At equilibrium, the thoron surface exhalation rate is given by equation (3). From equation (3), the thoron surface exhalation rates of the soil samples can be calculated. The observed values of radon mass and thoron surface exhalation rate of soil samples of different places of Amritsar and Tarn Taran district of Punjab are shown in [Table 1]. The median value of radon mass and thoron surface exhalation rate has been found to be 21 mBq kg −1 h −1 and 730 Bq m −2 h −1 for Amritsar district and 23 mBq kg −1 h −1 and 699 Bq m −2 h −1 for Tarn Taran district, respectively. 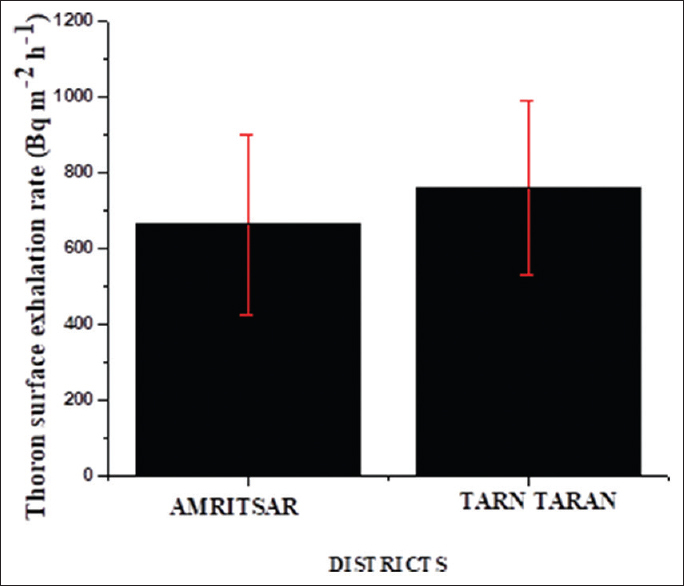 [Figure 4] represents the mean value of radon mass exhalation rate for both Amritsar and Tarn Taran districts. 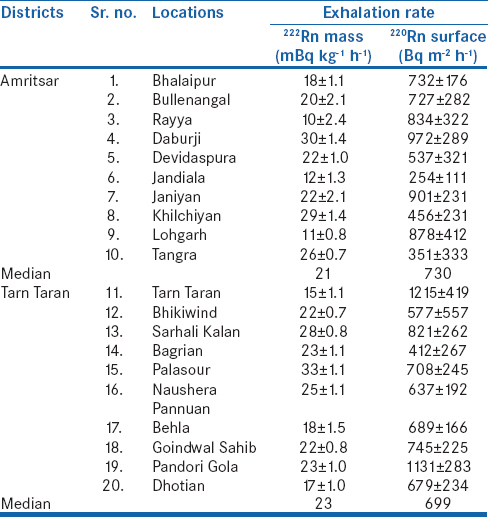 The mean value of radon mass exhalation rate for Tarn Taran district (23 ± 5 mBq kg −1 h −1) was found comparable with the mean value of Amritsar district (20 ± 7). 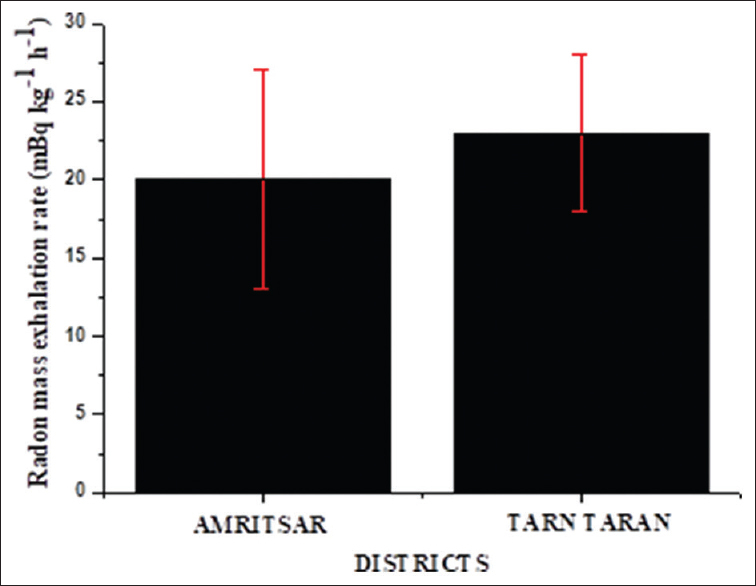 Similarly, [Figure 5] represents the mean value of thoron surface exhalation rate for both Amritsar and Tarn Taran districts. The mean value of thoron surface exhalation rate for Tarn Taran district (761 ± 231 Bq m −2 h −1) was found higher than the mean value of Amritsar district (664 ± 237). However, overall value of radon mass exhalation has been varied from 10 ± 2.4 to 33 ± 1.1 mBq kg −1 h −1, and thoron surface exhalation rate has been varied from 254 ± 111 to 1215 ± 419 Bq m −2 h −1, respectively. 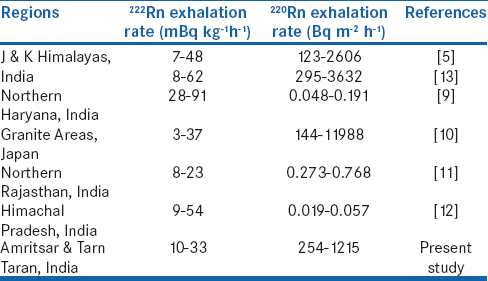 The results of obtained values of radon mass and thoron surface exhalation rate were compared with reported data [Table 2]. The values of radon mass exhalation rate were found comparable with the values of granite areas of Japan (3–37 mBq kg −1 h −1), and Northern Rajasthan (8–23 mBq kg −1 h −1), respectively. However, the value was found lower than Northern Haryana (28–91 mBq kg −1 h −1), Himachal Pradesh (9–54 mBq kg −1 h −1), and Jammu and Kashmir Himalayas, India (7–48 mBq kg −1 h −1 and 8–62 mBq kg −1 h −1),, respectively. Similarly, the value of thoron surface exhalation rate was found to be higher than Himachal Pradesh (0.019–0.057 Bq m −2 h −1), Northern Rajasthan (0.273–0.768 Bq m −2 h −1), and Northern Haryana (0.048–0.191 Bq m −2 h −1), respectively. The value was found to be lower than Jammu and Kashmir Himalayas, India (123–2606 Bq m −2 h −1 and 295–3632 Bq m −2 h −1), and lower than granite areas of Japan (144–11988 Bq m −2 h −1), respectively. Karthik Kumar MB, Nagaiah N, Mathews G, Ambika MR. Study on influence of soil and atmospheric parameters on radon/thoron exhalation rate in the Bangalore University campus, Bengaluru. Radiat Prot Environ 2018;41:8-11. Khan MS, Srivastava DS, Azam A. Study of radium content and radon exhalation rates in soil samples of northern India. Environ Earth Sci 2012;67:1363-71. United Nations Scientific Committee on the Effects of Atomic Radiations (UNSCEAR). Sources, Effects and Risks of Ionizing Radiation. New York: United Nations; 2000. Kaur M, Kumar A, Mehra R, Mishra R, Sharma N. Assessment of primordial and anthropogenic radionuclide contents in the soil samples of lower Himalayas of Jammu & Kashmir, India. Radioanal Nucl Chem 2018a;317:1165-74. [Doi: 10.1007/s10967-018-5988-9]. Kaur M, Kumar A, Mehra R, Mishra R. Study of radon/thoron exhalation rate, soil-gas radon concentration, and assessment of indoor radon/thoron concentration in Siwalik Himalayas of Jammu & Kashmir. Hum Ecol Risk Assess 2018b; 24:2275-87. Gaware JJ, Sahoo BK, Sapra BK, Mayya YS. Development of online radon and thoron monitoring systems for occupation and general environments. BARC News Lett 2011;318:45-51. Kaur M, Kumar A, Mehra R, Mishra R. Study of soil radon gas concentration and radon exhalation rate in the lower Himalayas of Jammu & Kashmir (India). J Environ Bio Sci 2017;31:453-8. Sahoo BK, Nathwani D, Eappen KP, Ramachandran TV, Gaware JJ, Mayya YS. Estimation of radon emanation factor in Indian building materials. Radiat Meas 2007;42:1422-5. Chauhan RP, Kumar A, Chauhan N, Joshi M, Aggarwal P, Sahoo BK. Ventilation effect on indoor radon-thoron levels in dwellings and correlation with soil exhalation rates. Indoor Built Environ 2014;25:203-12. Prasad G, Ishikawa T, Hosoda M, Sahoo SK, Kavasi N, Sorimachi A, et al. Measurement of radon/thoron exhalation rates and gamma-ray dose rate in granite areas in Japan. Radiat Prot Dosimetry 2012;152:130-4. Duggal V, Mehra R, Rani A. Study of radium and radon exhalation rate in soil samples from areas of Northern Rajasthan. J Geol Soc India 2015;86:331-6. Singh P, Singh S, Bajwa BS, Sahoo BK. Radionuclide contents and their correlation with radon-thoron exhalation in soil samples from mineralized zone of Himachal Pradesh, India. Radioanal Nucl Chem 2017;311:253-61. [Doi: 10.1007/s10967-016-4975-2]. Kumar A, Vij R, Sharma S, Sarin A, Narang S. Assessment of radionuclide concentration and exhalation studies in soil of lesser Himalayas of Jammu and Kashmir, India. Acta Geophys 2018;66:1195-202. [Doi: 10.1007/s11600-018-0119-0].